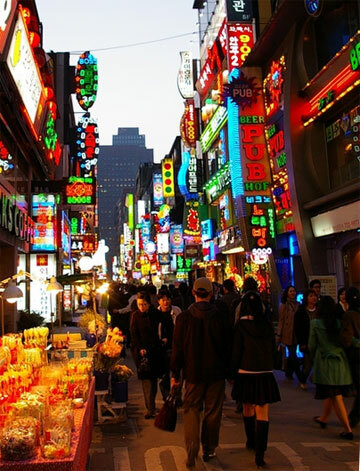 Capital, largest city and one of the most popular tourist destinations in South Korea = Seoul. Asia fascinates me….the culture, food, the people, the tourist attractions…every country in Asia is unique and that is why you have to travel to a couple of destinations on this continent in order to get a feel for it. Having visited Japan, China and India, my next destination was to be Seoul in South Korea. I would recommend booking flights to Incheon International Airport, which is the largest hub in South Korea and the main gateway to Seoul. I travelled with Delta Air Lines, but there are many other companies which operate flights to Seoul, such as Korean Air and Asiana Airlines. So what is there to see? As I mentioned before, I decided to visit Seoul because I had never been to South Korea and where better to start than in the capital city. When I arrived in Seoul, I was taken aback by the number of palaces in the city. There are five and many of them are definitely worth visiting. Gyeongbok-gung is perhaps the most famous and apart from being a personal favourite, this palace has historical importance being the first one used by the Joseon Dynasty. Other important palaces to look out for are Changdeok-gung and Deoksu-gung. Like me, you will probably love wandering around this city because the architecture is so different and you will get to see shrines and temples you just don’t find in the western world. After exploring the city, you should do what I did and head for the mountains…especially if you like hiking. The mountains in Seoul are accessible and especially designed for tourists as they have trails marked out. Bukhansan is perhaps one of the best mountains to visit and here you can take a tour of Bukhansan National Park. Not only can you enjoy hiking but you can get great pictures of South Korea’s landscape, birds and there are also lovely views of Seoul from the mountain. I loved sightseeing by day, going on day trips and then by night trying South Korean food in a traditional restaurant. Don’t forget to buy some souvenirs before returning home. I would recommend going to Namdaemun, which is a market located in the centre of Seoul….here you will get lots of presents. ← When to Go to Asia?